“Return with us now to those thrilling days of yesteryear” and build the Bayou Jumper. The name “Bayou Jumper” is a play on “Ocean Hopper”, a famous regenerative receiver of a bygone era. It retains that great retro look but with modernized circuitry. With it’s distinctive panel and wood box enclosure it pays homage to the famous spy radios of WWII. It is designed for the CW segment of the 40 meters. 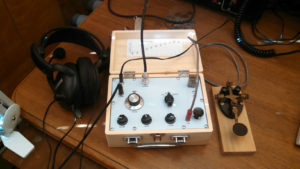 4 State QRP Group’s Bayou Jumper transceiver. As the radio had received quite a bit of discussion on the 4SQRP mailing list since its introduction last spring at Ozarkcon, my interest was piqued. Once the announcement was made I put my order in to experience this homage to yesteryear. The kit of parts arrived just after Christmas but I put off beginning assembly until after New Years. In the mean time I managed to get to the nearest Hobby Lobby in Manhattan, KS to pick up the small wood case the boards are designed to fit. I estimate that I spent close to eight hours between all assembly and alignment steps. Others may be able to do it much faster but I wanted to be able to savor and enjoy the build. Still, despite careful work, I managed to put a capacitor in the wrong place. Fortunately, I caught my error in time and made the correction before finding out the receiver was not working correctly. The regenerative receiver came up upon first power up which was a relief. But where was it? Other builders had reported their receivers working at the upper end of 40m or even in the SWBC band above 40m. I found mine operating above 40m and it was a matter of trial and error to squeeze the 19 turns on the torrid enough to move it to the low end of 40m. During assembly the builder is instructed to leave one capacitor out unless it is determined to be needed later. Later during the alignment of the regeneration advice is given for determining whether that capacitor is required. My regeneration did not kick in until the knob was around the 3 O’clock mark which gave a rather limited regeneration range. After soldering the capacitor in place the regeneration now kicks in around 10 O’clock allowing for plenty of regeneration range. The transmitter is a very simple crystal controlled circuit. Two crystals are supplied with the kit, 7030 and 7122 kHz. The latter is sort of a 4SQRP “watering hole”. As it worked out, the 7122 kHz crystal supplied to me is an HC49S, the low profile version. Others noted that such would fit into an FT-243 crystal holder. One of the locals gave me a couple of spare FT-243 holders and I gutted the one and soldered the 7122 kHz crystal into it. The other builders noted that their transmitters were operating about 1 kHz below the crystal frequency. Mine was no exception, transmitting a few Hz above 7121 kHz. Operationally, the regeneration is smooth (this is the first regen I’ve had much experience with). The VFO is fast as it is a PCB mounted 50k Ohm potentiometer with about 140 kHz covered in 270 degrees or so of rotation. A slow and steady hand is required. Some builders have fitted verniers, a multi-turn potentiometer, or digital counters to their Jumpers to slow the tuning. Received note is clean and the regen is stable. The built in key is not adjustable but usable. A jack is provided to connect an external key (some caveats apply). On Saturday afternoon, January 21, I heard KD9ELU calling CQ around 71212 kHz. Upon my answering his call he came right back and we had a QSO that lasted about half an hour. Signals were good and he reported solid copy on each over. I did need to touch up the VFO once during the QSO. As I had already practiced tuning it, I didn’t lose Eric’s signal. In practice the passband is wide enough that concentration is required in the presence of other nearby signals. I did have an external straight key plugged in for this QSO as seen in the picture below. I highly recommend this kit for the intermediate to the experienced builder. Its regenerative receiver is easy to use and covers a narrow enough range as to be usable through the lower half of 40m. Along with its crystal transmitter it allows experiencing amateur radio from yesteryear in a compact package. My Bayou Jumper set up for its first QSO with KD9ELU. 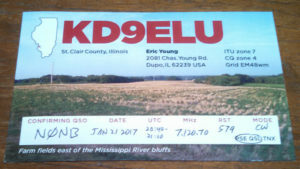 QSL card from Eric, KD9ELU, commemorating the first QSO made with my Bayou Jumper. 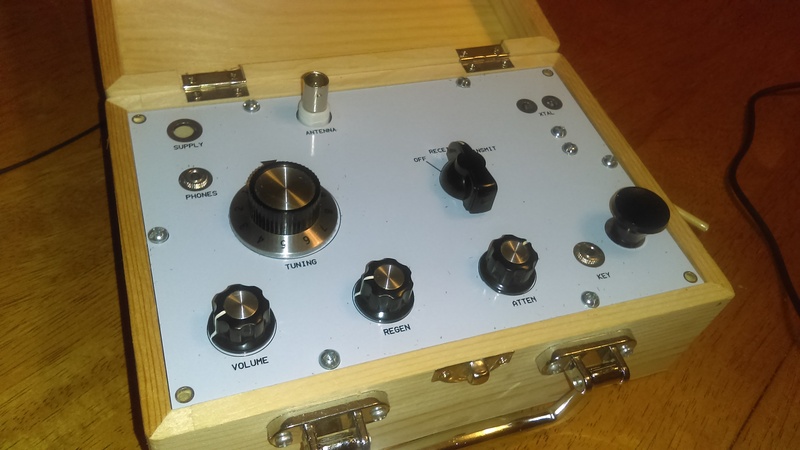 This article was also posted to the QRZ.com Homebrew and Kit Projects forum. An amateur radio operator, vintage motorcycle enthusiast, and all around tinkerer interested in too many things to focus on one for very long. When I'm typing here, it's likely that I should be doing something else. This entry was posted in Amateur Radio, Kits. Bookmark the permalink.